Anna Mollah wept uncontrollably in her Glen Oaks, Queens, home as she remembered how her husband used to beat her. He punched her stomach when she was pregnant with their first son, kicked her when she was carrying their daughter and did it again during the third pregnancy. He hit her when they disagreed over the Con Edison bill, or when he had headaches, or when he disapproved of school supplies she bought the kids. He repeatedly called her “worthless,” “garbage” and “good for nothing,” and made her believe it. One day she used the family car to run errands without his permission and he got mad. They argued and he grew madder. Then he flew into a rage, wrapped his hands around her neck and squeezed. She tried to scream for help as he strangled her. She was able to utter, “I’ll call the police.” Then he shoved her to the ground. She buried her face in her small hands and sobbed as she recalled her fear and the horror in her children’s eyes as they watched. Mollah was a victim of domestic violence for two decades. As a Muslim immigrant from Indonesia, she knew no one in New York City she could turn to for help. 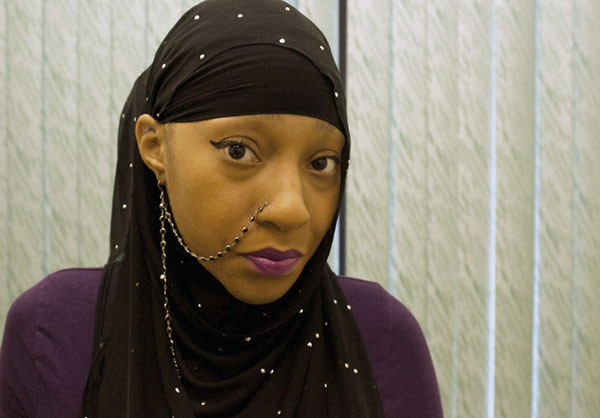 Anna Mollah describes the domestic abuse she faced for years. So Mollah remained silent for 20 years, divulging her secret to God only. For Mollah, and thousands of battered immigrant women like her, breaking the silence proves to be excruciatingly difficult. Foreign-born women fail to report abuse more than American women for a number of reasons: language barriers, the fear of deportation and cultural taboos about discussing marital problems, according to New York City’s Office to Combat Domestic Violence. Mollah hid the abuse for years and was even too embarrassed about it to confide in her mother and sister when they later moved to Queens. Hundreds of non-profit organizations in New York City provide support for abused women. The OCDV operates facilities that direct victims to the various support groups, shelters and legal resources. Staff members speak more than 20 languages collectively and have capabilities to communicate in 150 languages. But some anti-abuse advocates say many organizations aren’t able to cater to specific immigrant groups, which are newer to New York City. They say victims often prefer to seek help among people of their own ethnicity or religion. Robina Niaz, director of Turning Point for Women and Families, said the most recent immigrants to arrive, such as South Asians and Muslims — like Mollah — are still struggling to create their own resources. Niaz founded the Flushing-based group in 2004 to address the needs of Muslim women. It remains the only Muslim-based abuse support organization in the city today. Niaz believes many agencies cannot meet the needs of Muslim women and subsequently fail to create that safety zone. For instance, Niaz says few shelters have extra space where devout Muslims can pray. She also mentioned many safe houses do not take fasting and dietary needs into consideration when preparing meals; Muslims do not eat pork, for example. Niaz added Muslim women are traditionally reticent in discussing personal hardships. She admitted she kept secret the verbal abuse waged against her by her husband. Niaz believes if Muslim organizations become more visible, domestic violence will become less of a stigma. New York City is home to the second largest Muslim population in the United States, and Niaz expects to see an increase in the number of Muslim victims seeking help. Keeping up with the demand has proved challenging. Turning Point has counseled more than 250 women since the group’s inception, but Niaz believes she could provide more help with more employees and money. Niaz has a fulltime staff of two, with just three more part-time workers. Office space is limited and consists of one small counseling room. And she is short on funding. A large grant given to the non-profit by its main funder will sunset in June. Money is not exactly pouring into Muslim groups. Islamic organizations including Turning Point still face post-9/11 hostility. “The anti-Muslim sentiments are going strong,” said Adem Carroll, chairman of New York City’s Muslim Consultative Network. Carroll said Americans are growing increasingly cautious about having their names affiliated with Muslim organizations and refuse to donate to Islamic charities. Niaz credits city, state and federal agencies for being aware that immigrant-based abuse organizations need aid. But she is discouraged that the government is not making such assistance a priority. “Saying we’re in touch with the problems is not the same thing as physically making sure needs are met,” Niaz said. Until city agencies step in with funding, Niaz encourages the Muslim community to build its own arsenal of resources. She warns there is a severe lack of Muslim social workers and attorneys. While New York City’s Muslim community strives to establish more anti-abuse organizations, people like Mollah still agonize over their own fractured support webs. She finally visited a few organizations after her husband choked her. While the groups provided emotional support, few offered the help she needs to combat a series of legal and financial problems. In February 2007, Mollah filed for divorce and her husband moved out. She said he still refuses to pay child support and make mortgage payments because he has a “good lawyer” who can “get him out of it.” Mollah’s lawyer quit when she couldn’t afford to pay $2,000 she owed him. She desperately is seeking employment since being terminated from her computer-related job after a car accident left her in the hospital and unable to work for months. A social worker dropped her case when she missed appointments, opting instead to attend technology classes and job interviews. She admitted every day it’s a challenge to feed her teenage son who still lives at home. Her other two children are at college living on financial aid and scholarships. She doesn’t know where to turn for a new attorney, food stamps or temporary assistance to pay medical bills and mounting debt. And, she said, she has exhausted her options. The uncertainty has caused Mollah to unravel emotionally and physically. She has little time to maintain her appearance or the appearance of her home. Black makeup caked under her eyes thanks to dried tears — she looked tired from all the stress. She kept apologizing for the overflowing boxes of divorce paperwork and piles of clothing on the living room floor. Mollah manages to hold herself together for the sake of her children. She said she still prays every night, and she is comforted by her belief that the worst is behind her. But Mollah still needs help and isn’t ashamed to speak up this time. Heartbreaking. Both the print story and the powerful audio are outstanding. The problem of domestic abuse is in part a problem of shame and silence for the victims and the witnesses. Painful, important reporting, Liz. a teenager in my teens by a sibling. My mother protected this sibling and she said she would not pay for my college if I said anything to anyone. So, I sufeered from the bullying, constant put down in my teens. Later when I went to college, my sophmore year at the university I started seeing a Christian man who came from Europe.